Organizations around the world valiantly try each year to make it through another compensation planning cycle relying on spreadsheets. However, increasingly complex compensation process requirements make it more and more difficult for organizations to justify using “low-tech” tools. Our 2017 Total Compensation Management benchmark research finds that 83% of participants experienced some degree of paycheck errors after their compensation spreadsheets were passed on to payroll. If these problems were only confined to payroll, the damage would be mitigated. Unfortunately, errors such as these almost always contribute to other operational challenges for an organization. 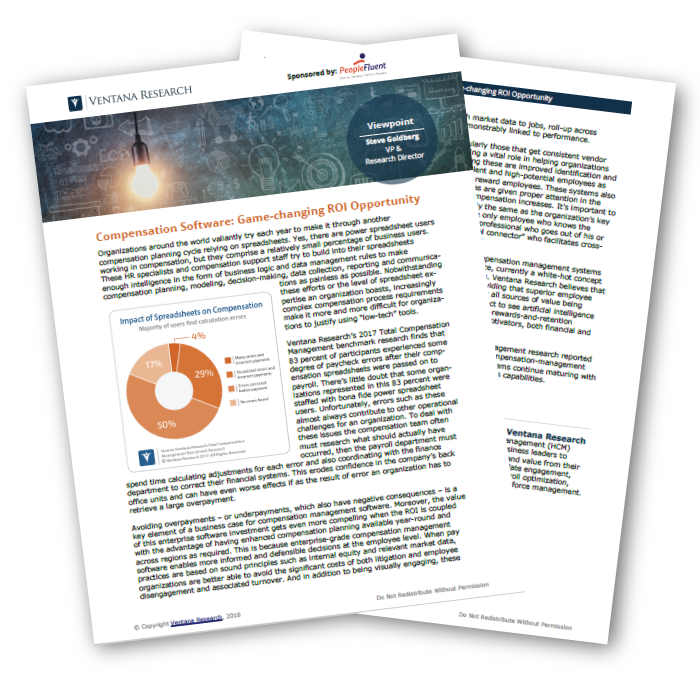 Modern compensation management systems, particularly those that get consistent vendor support for research and development, are now playing a vital role in helping organizations achieve crucial HCM-related business outcomes. Are you utilizing these new tools? Get the full picture of their impact in the viewpoint, download it now!